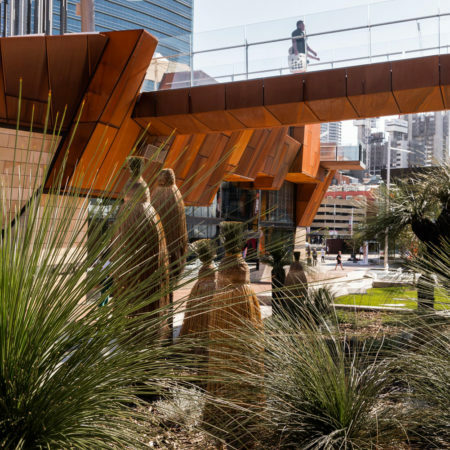 Yagan Square is a project of local and state significance for the city of Perth and Western Australia, located at the east end of the new MRA Citylink development which seeks to physically reconnect Northbridge with the Perth’s CBD (and the Swan River). 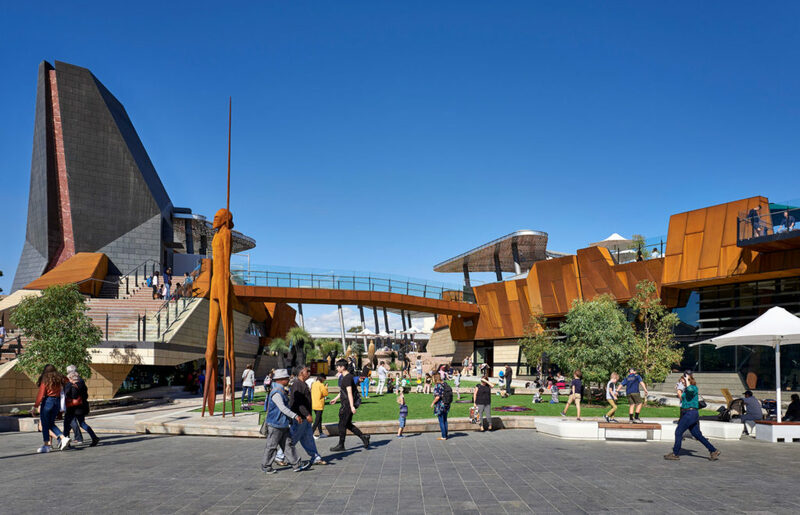 Yagan Square is located within one of the city’s busiest pedestrian zones, establishing a major transit hub linking to the central Perth Train Station and Busport. 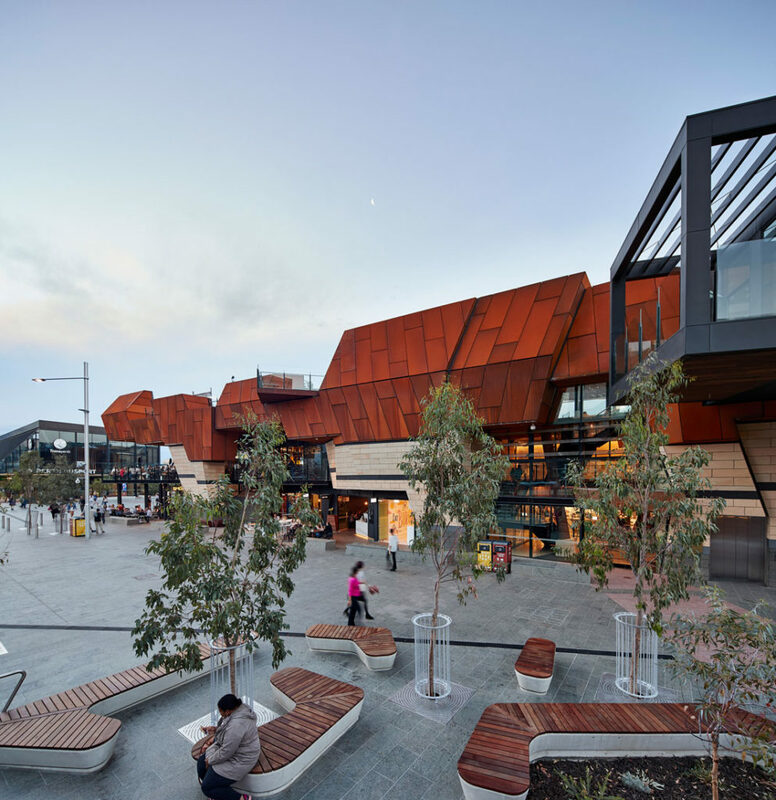 Urban connections are forged, realigning the city with its prior landscape and linking the city to Northbridge for the first time. 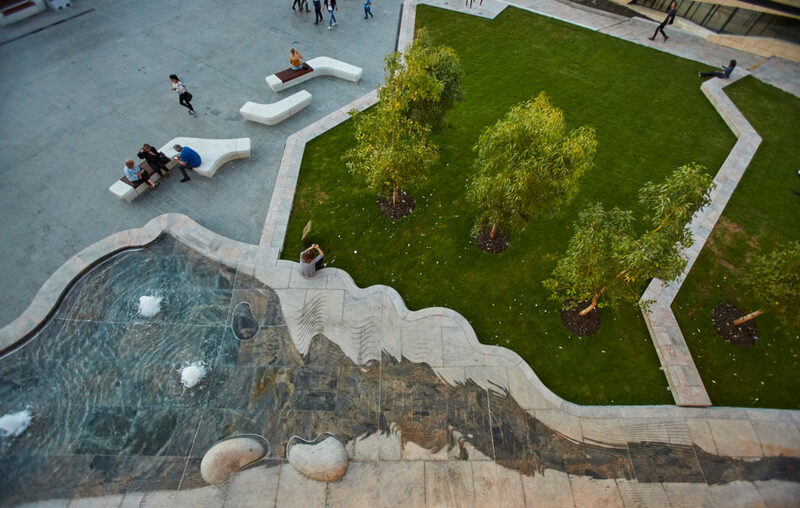 The Square embodies a new urban typology, fusing culture, history, art, food, architecture and landscape. 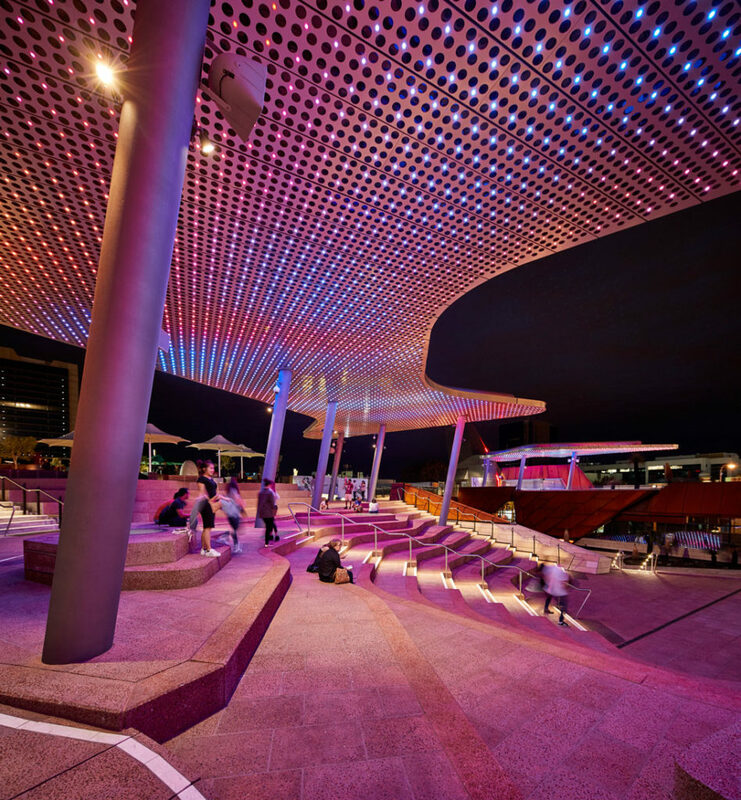 A captivating civic landmark, the new world-class cultural and civic space has revitalised the heart of Perth. 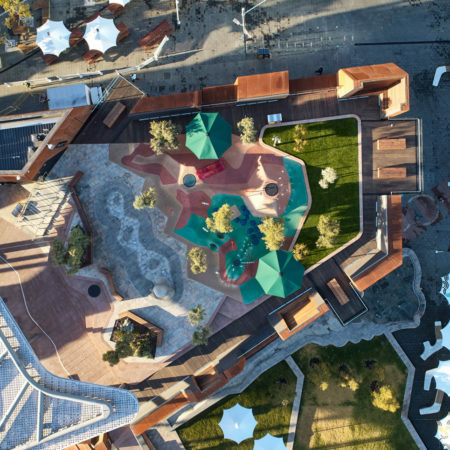 The design develops a clear cultural idea about the place of Yagan Square within the city and country, and is representative of the idea of convergence: of geologies, ecologies, tracks, narratives, indigenous and non‐indigenous people. 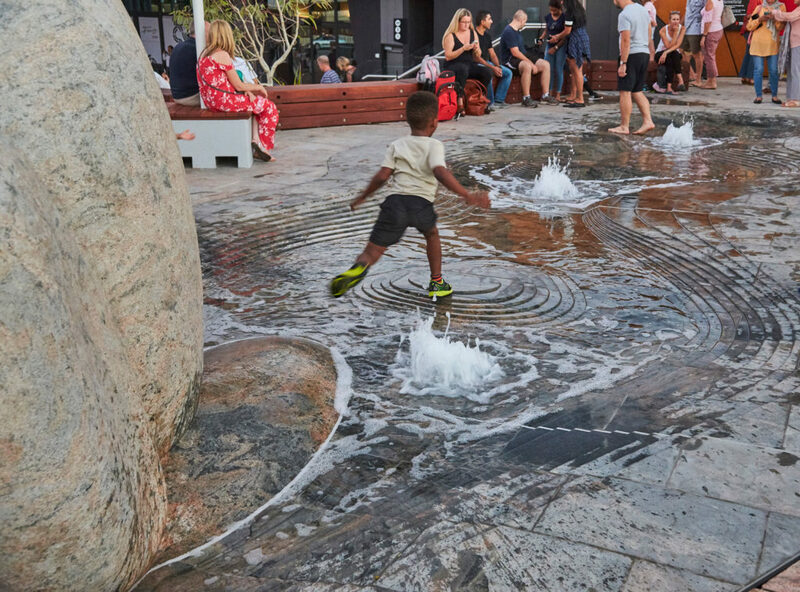 The design elements of the meeting place, the digital tower, marketplace, playground, landscape ecologies and art are arranged to repair and amplify connections to the adjacent areas of the city and Northbridge. 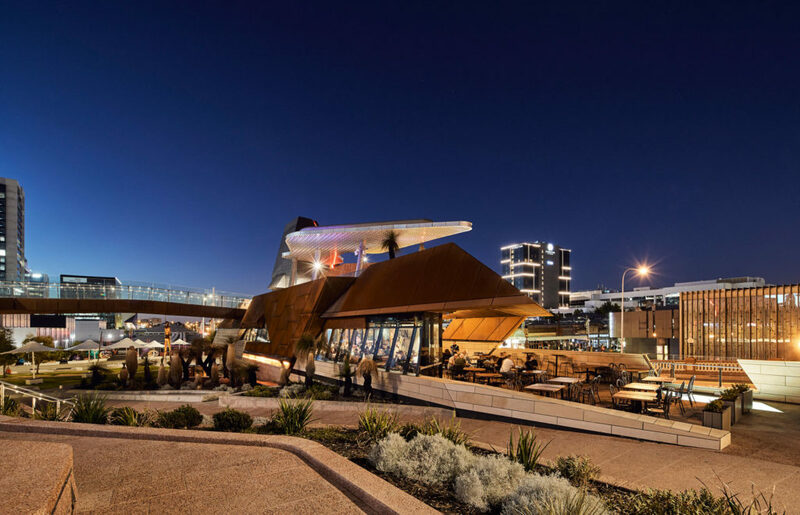 The $73.5 million, 1.1 hectare project, four years in the making, was delivered by the Western Australian Government through the Metropolitan Redevelopment Authority (MRA). 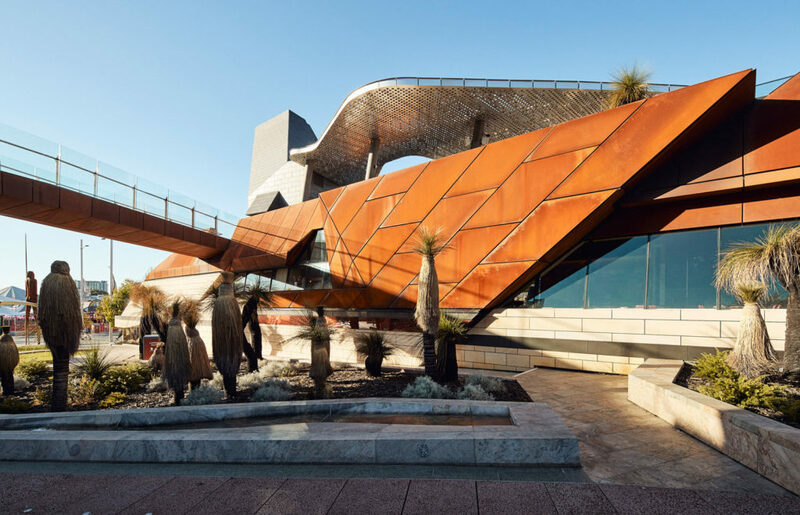 It is the result of a pioneering collaboration between Lyons Architecture (lead consultant), iredale pedersen hook architects, ASPECT Studios and the Whadjuk Working Group. 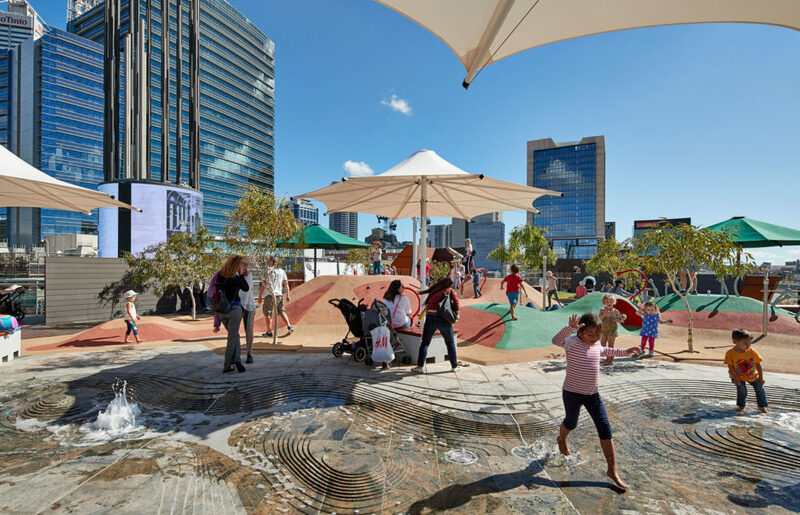 Providing urban definition, with inflected spaces, the civic presence of Yagan Square has resulted from the underlying systems of place. 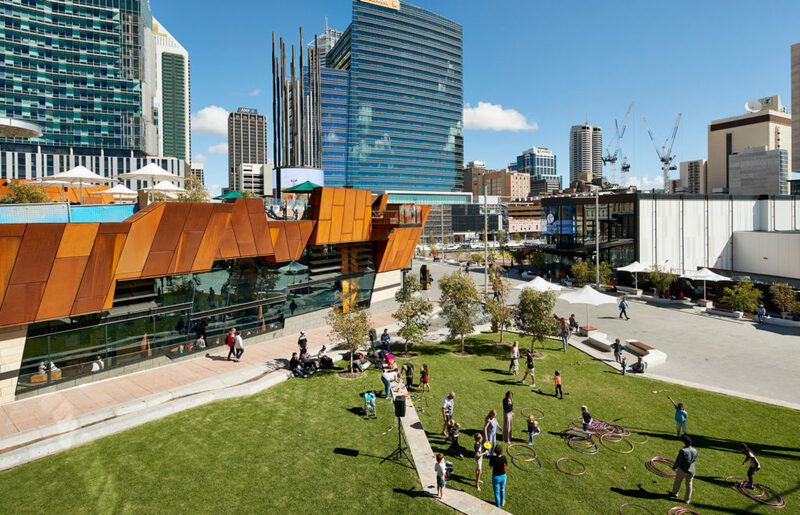 The small site footprint with its associated challenges has resulted in a design response that has delivered cultural density within the constraint of spatial density. 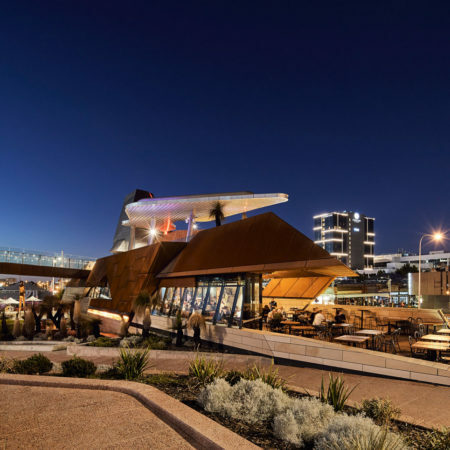 The result is an iconic destination that showcases West Australian heritage, environment, produce and culture, and which is embraced by locals and visitors alike. 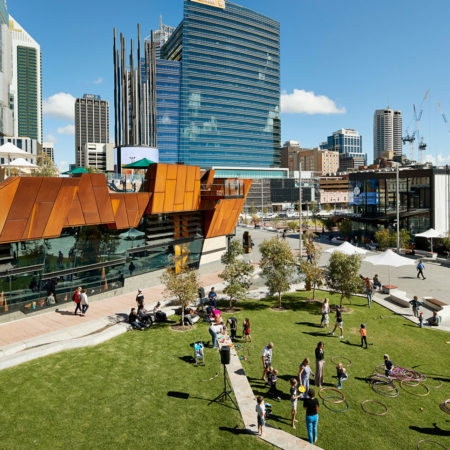 The new heart of Perth, Yagan Square stands as a global blueprint for successful public realm design. 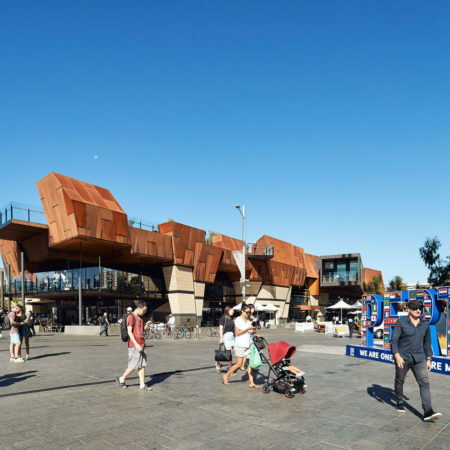 • Repairing of the community’s connection to site through a clear cultural positioning of Yagan Square. Representative of ideas of convergence: geologies, ecologies, tracks and narratives of indigenous and non‐indigenous people. • Emergence of a new typology of civic and public space. One that privileges art, people and the everyday experience. 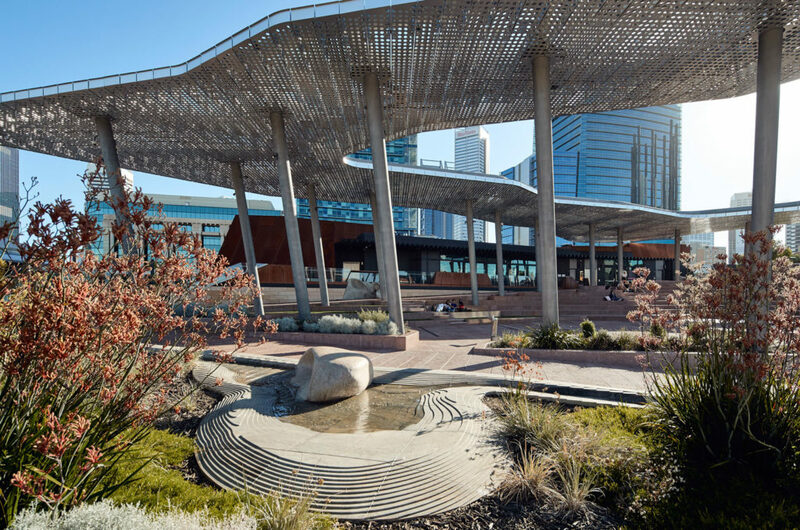 Importantly, this land once formed part of an extensive wetland system which was a significant meeting and food gathering space for Aboriginal people. 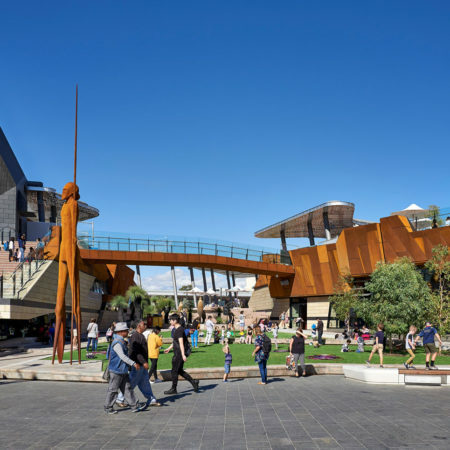 Yagan Square forms a critical piece of Perth’s decade-long City Link redevelopment plan to address the separation of the city centre from Northbridge by sinking railway infrastructure and in-filling with commercial redevelopment, entertainment precincts and public open space. 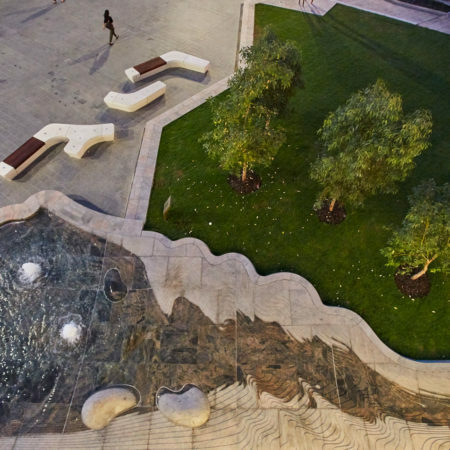 Named for Whadjuk warrior, Yagan, the early stages of design created opportunities for involvement by the Whadjuk Working Party and South West Aboriginal Land and Sea Council. 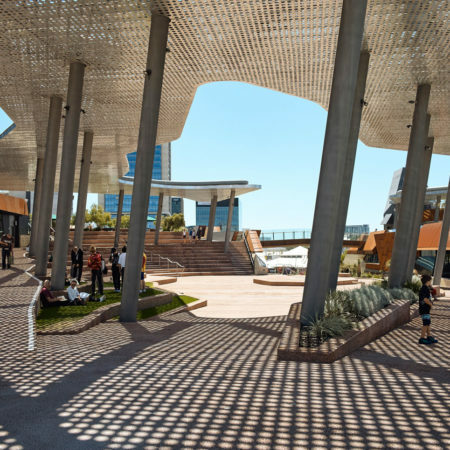 The project has established an inclusive and welcoming destination with a focus on reconciliation, culture and urban repair. 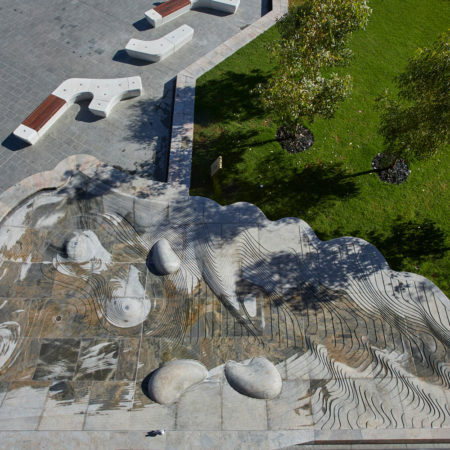 The project has formed a place of recognition for the Whadjuk story. 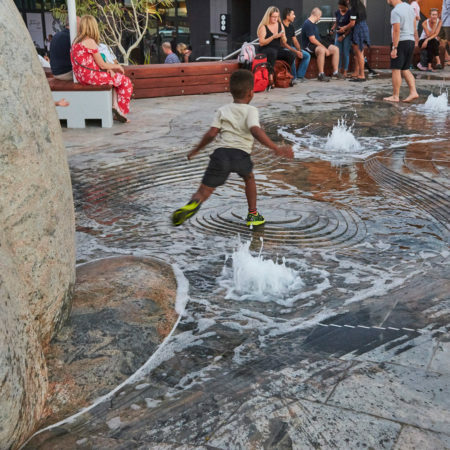 Culture and the land are inseparable in Traditional Owner society; the broken body of Yagan, the fourteen languages spoken by the Noongar people, the gathering places, the ground, the tracks, the water, the reeds, the nests, and the six seasons of country. Following English settlement, the land was surveyed, the lakes drained and surveyors grid imposed, forcing passage by foot along anti-topographical lines. Established in the late 1800’s the rail corridor running inland to the Indian Ocean dismembered the CBD from the northern suburbs. The Horseshoe Bridge, opened for traffic in 1904, offered the only crossing within a kilometre either side of the Central Station. 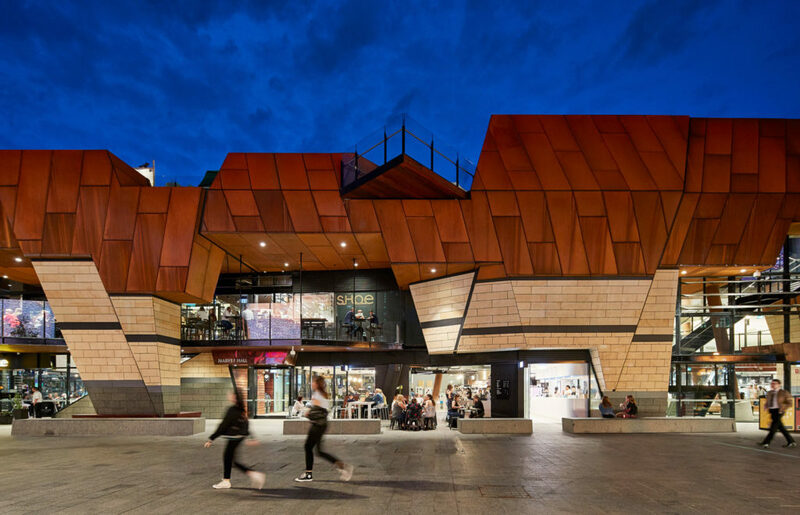 The Library, Art Gallery, Theatre and Museum are also on the ‘wrong side of the tracks’, isolated from the city’s inhabitants, further reinforcing the inaccessibility of the city’s cultural institutions. 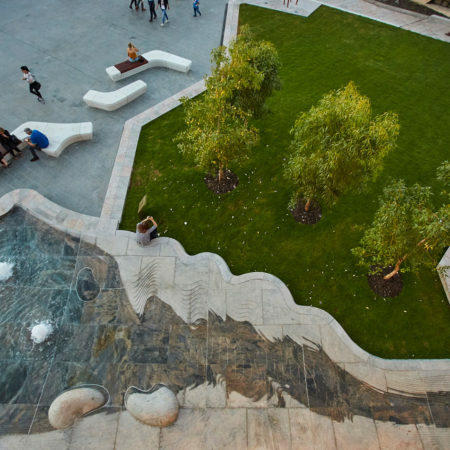 The project becomes an idea of both cultural repair and urban repair. A distinctive strategy for engagement with the Nyungar community was developed as an idea of cross cultural repair. 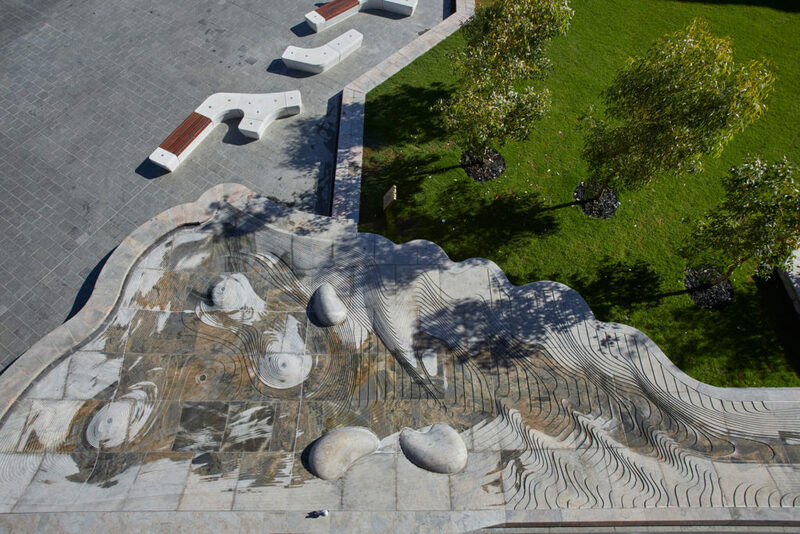 Through the Whadjuk Working Group, the community represented its interests through public interpretation, public art collaborations, on‐going cultural programming and employment opportunities. Integral to this relationship was the brokering of a common language able to mediate between the great place‐making story lines of Nyungar culture and their counterparts in non‐Aboriginal understandings of sense of place. 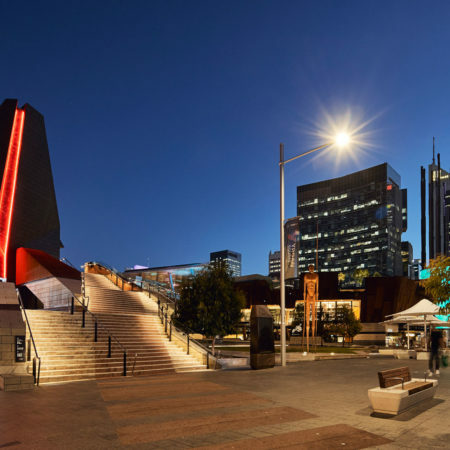 The success of this story‐based and symbol‐based approach is illustrated in the way the key Nyungar figures for Yagan Square ‐Yagan and Balbuk ‐ both shamefully treated in their own day ‐ are acknowledged and the legacy of their political leadership respectfully and powerfully embodied in the choreography of Yagan Square. 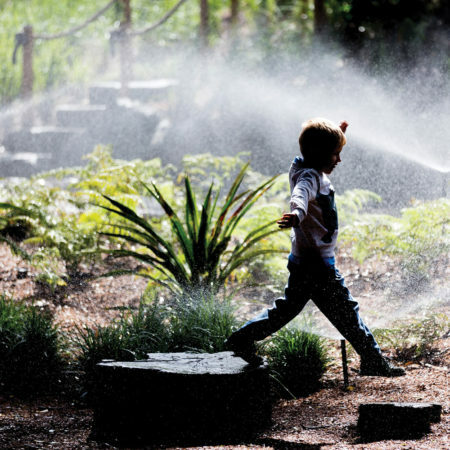 Repair is generative when the scars are acknowledged, not glossed over; in the wake of recognition pain can turn towards the reclamation of place. 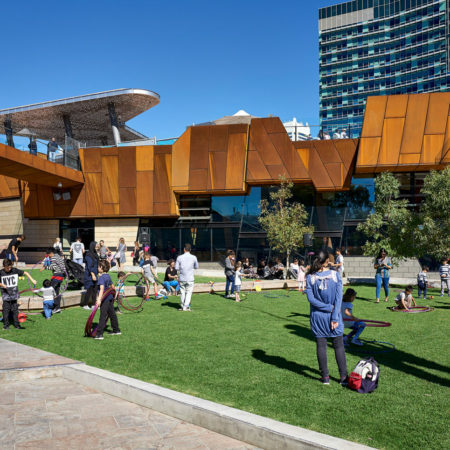 Everything at Yagan Square has been designed with intent; from the custom grown Eucalyptus trees and wildflower gardens that have cultural significance, to interpretations of former Indigenous tracks through the site and the digital canopies (shade) symbolising the area’s once-present lakes. 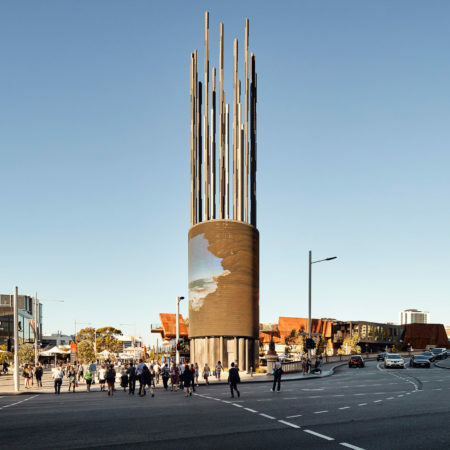 The digital tower is designed to symbolise the bulrushes once found on the lake system in the area, while the 14 surrounding bulrushes that propel into the sky from the tower represent the 14 Noongar language groups. 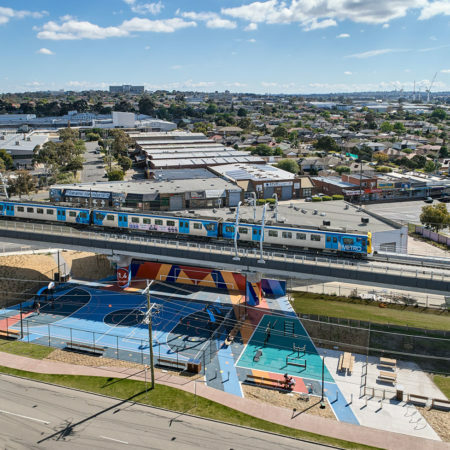 A significant challenge for the entire project team was the creation of a new public space and buildings on top of two underground railway lines on one hectare in between the colonial heritage Horseshoe Bridge. One railway line was at the beginning of its dive into a tunnel system and as such the main central landscapes sit directly on this steeply angled tunnel, ensuring little scope for soil depth and tree planting in these areas. 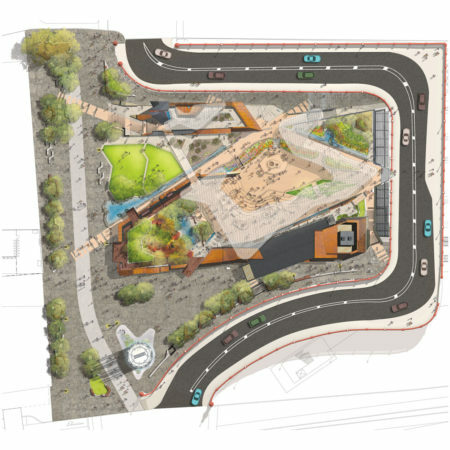 The complex resolution of level changes and movement patterns result in a constructed topography stitching together various pedestrian ‘tracks’ across the site, for instance linking the Perth Railway concourse and lower platforms to the Perth bus station and extending the Williams Street spine. 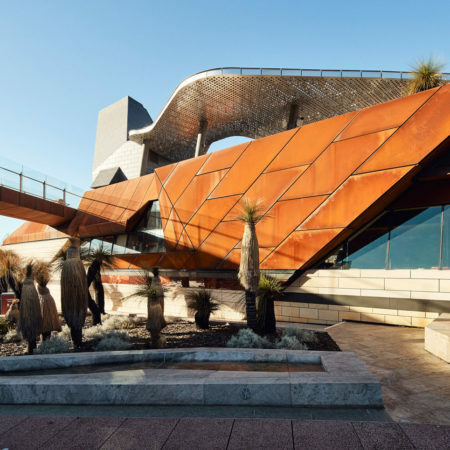 The resultant design is a jagged architectural form punctuated by peninsulas, look outs, ramps and staircases which huddles into the distinctive form of Horseshoe Bridge. 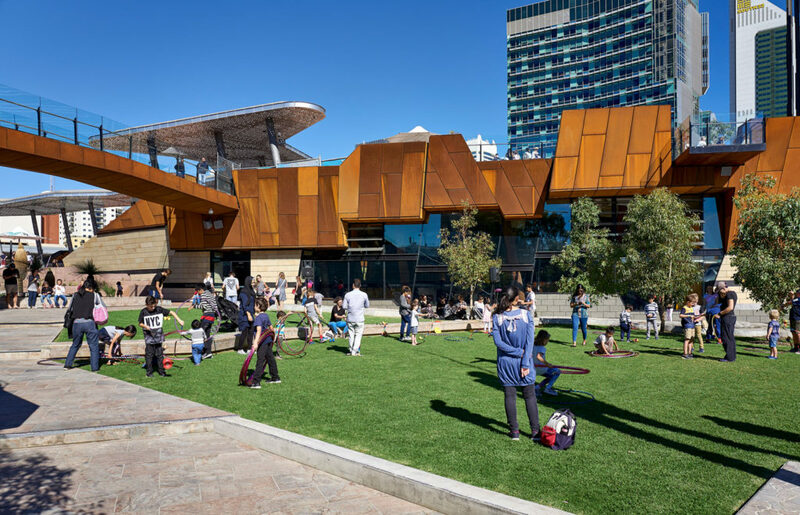 Yagan Square has a social ephemerality – an everyday gathering space with the potential for the extraordinary, referencing the lost wetlands buried under the site. It has the capacity to shape shift from a pleasant outdoor space suitable for a coffee or quick lunch into a major celebratory experience. 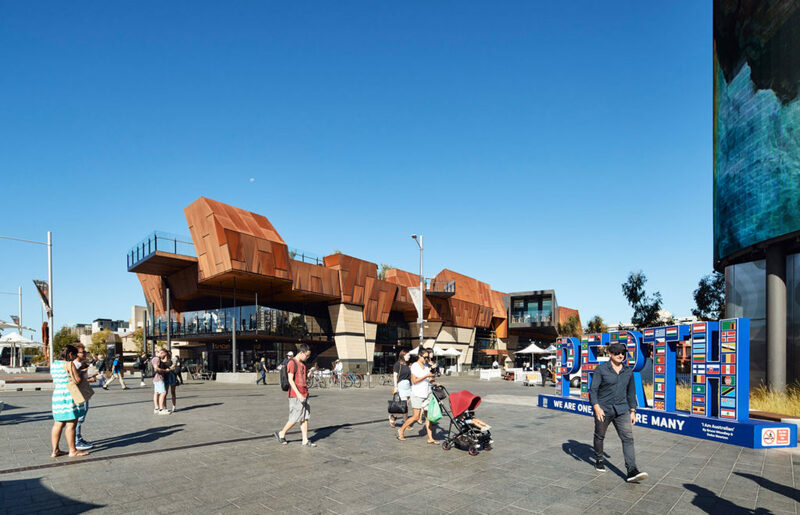 Adjacent to major art galleries, Yagan Square complements their cultural program and instead food forms the dominant use with a focus on high quality local and Western Australian food. 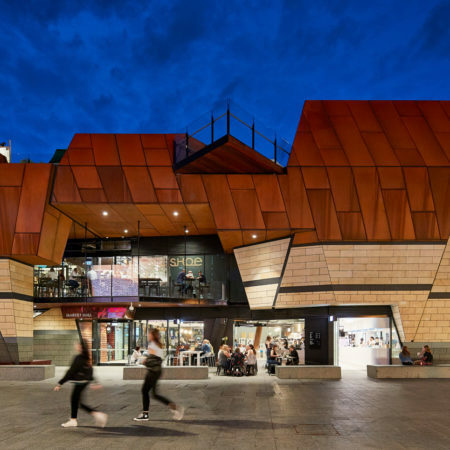 The unusual permeability of the architecture encourages people to move freely from interior eating spaces into the amphitheatre to listen to music or just enjoy sitting outside, when the subtler design achievements become more obvious. 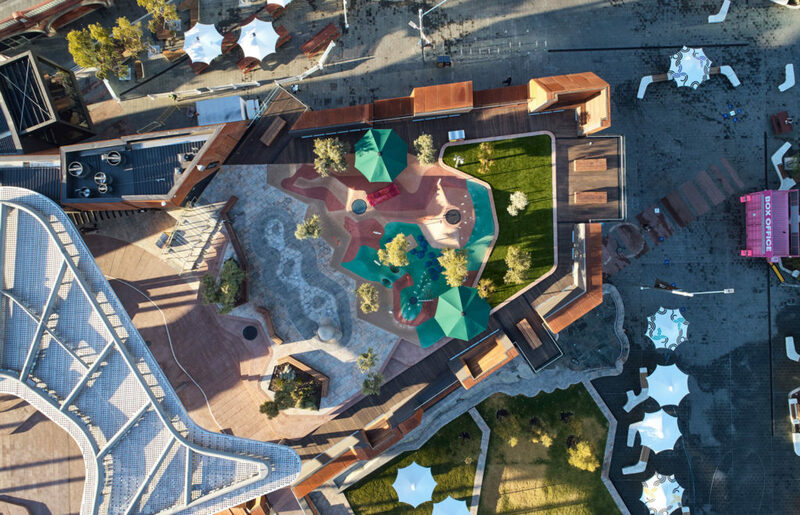 The elevated playspace constructed above the market hall, beyond the amphitheatre allows parents to supervise their kids but still be part of the action. Cut outs in the walls, along with many smaller sitting areas offer more intimate and quieter spaces, located away from bright digital lights and noise from the amphitheatre. 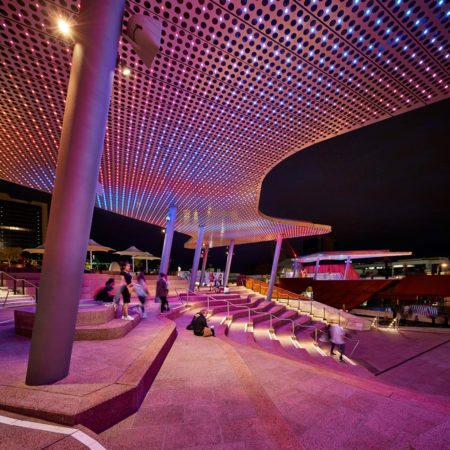 Capable of seating over 2,000 people, Yagan Square’s amphitheatre’s generous scale is broken down through plantings, lawn and a monumental metal canopy which floats over large sections of the steps and ramp. 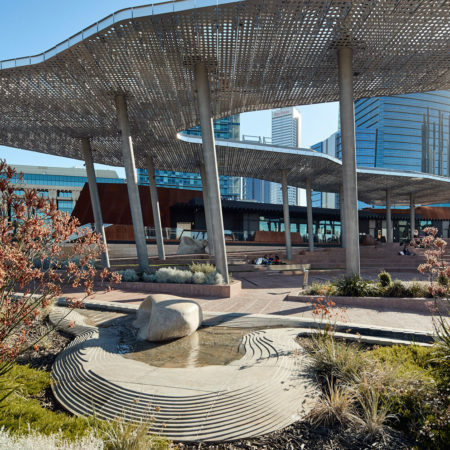 From this elevated position, the space catches cooling breezes, while the high canopy, referencing past wetlands, modulates light throughout the day. 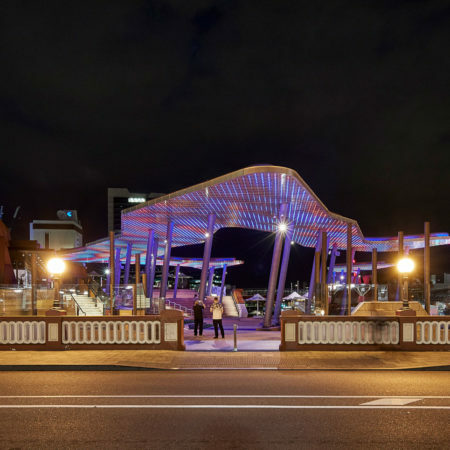 Designed to reflect digital content from above and below, the canopy structure spectacularly projects colourful abstract lighting patterns through to more refined digital images referencing the site’s environmental history and Indigenous place. 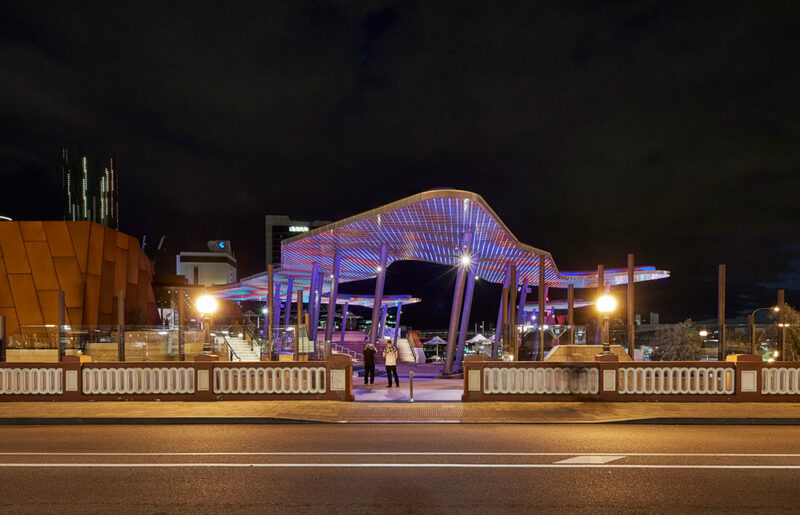 Dual functioning, the canopy forms a critical part of digital program which comes to life at night. 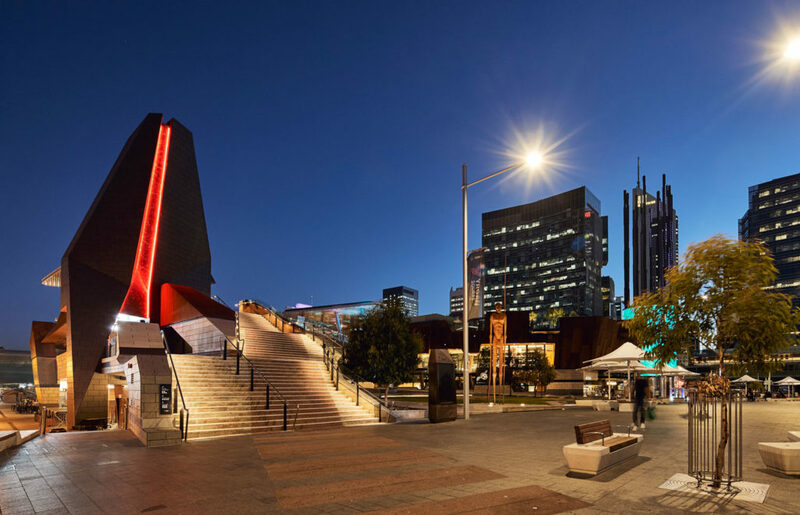 Working in combination with a 45 metre high digital tower located at street level and crowned by 14 metal bull rushes, representing the 14 Noongar language groups, the visual projections are experienced well beyond the square, forming a major digital landmark for Perth’s CBD. 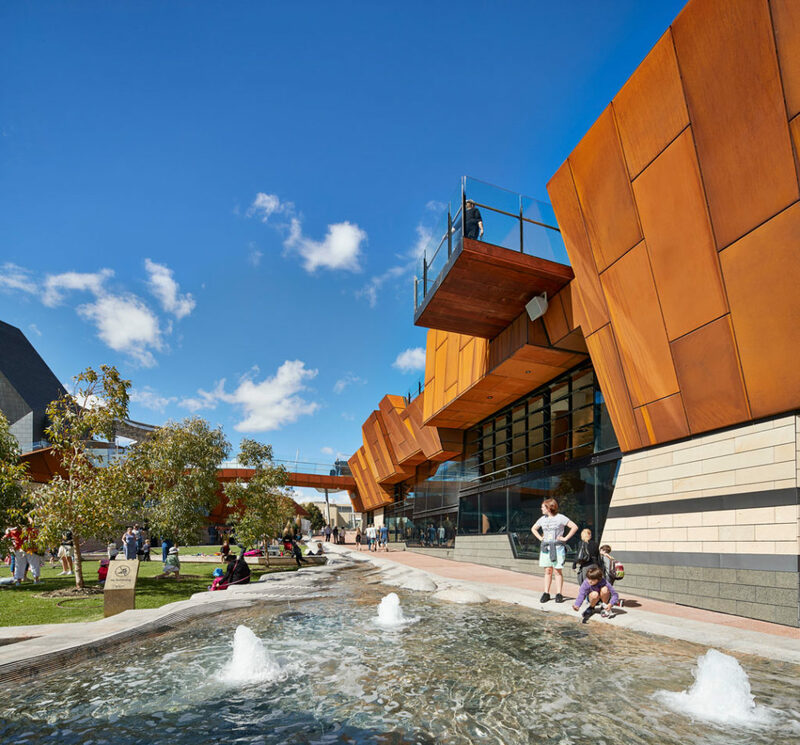 Materials throughout the Square suggest a traverse through geological strata moving from lower levels of ALSTRAL verde, to black granite, to limestone, to corten steel to jarrah timber, through to pink granites and local laterite pre cast panels of the expansive amphitheatre which lies at the heart of the project. 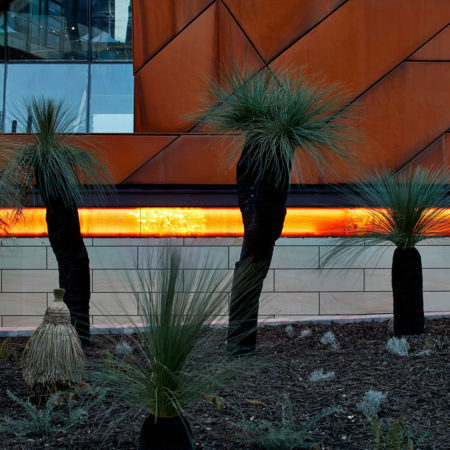 Native gardens throughout showcase the diverse qualities of Western Australia flora and landscape. 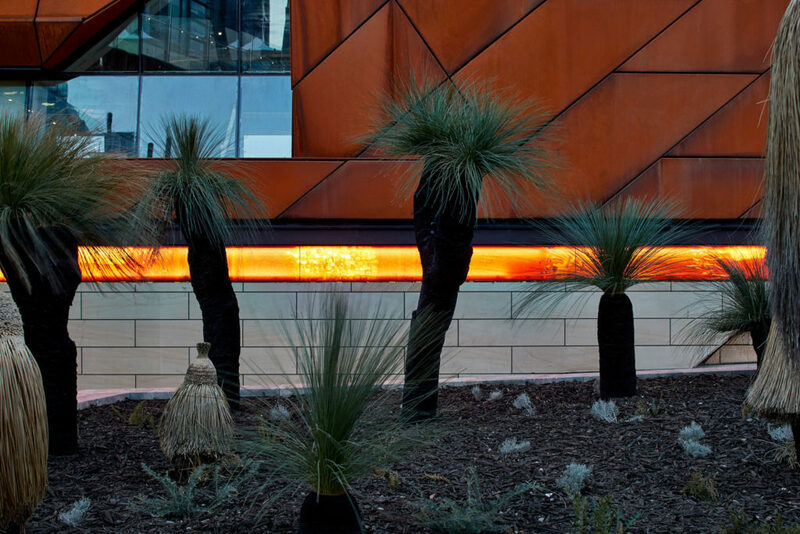 Visitors can see a variety of Eucalyptus species found in Perth and across the state. 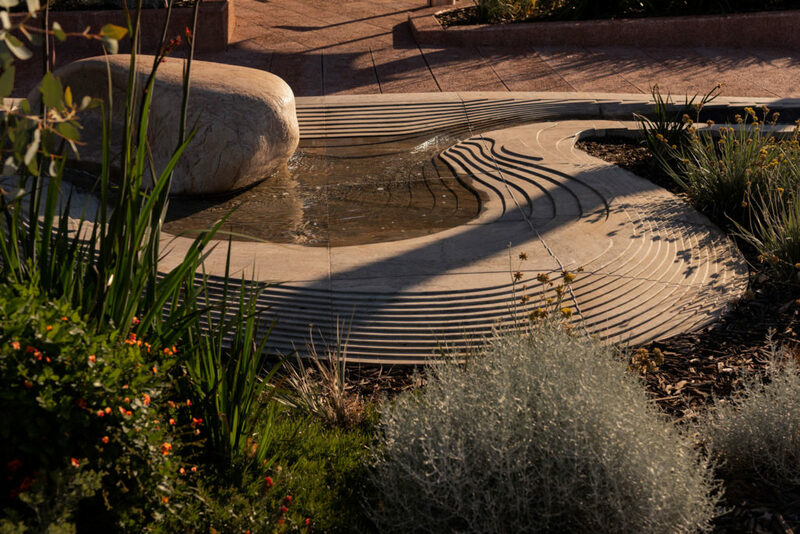 The planted gardens provide a natural infrastructure, support biodiversity and heighten the seasonal characteristics and colours of Western Australia. 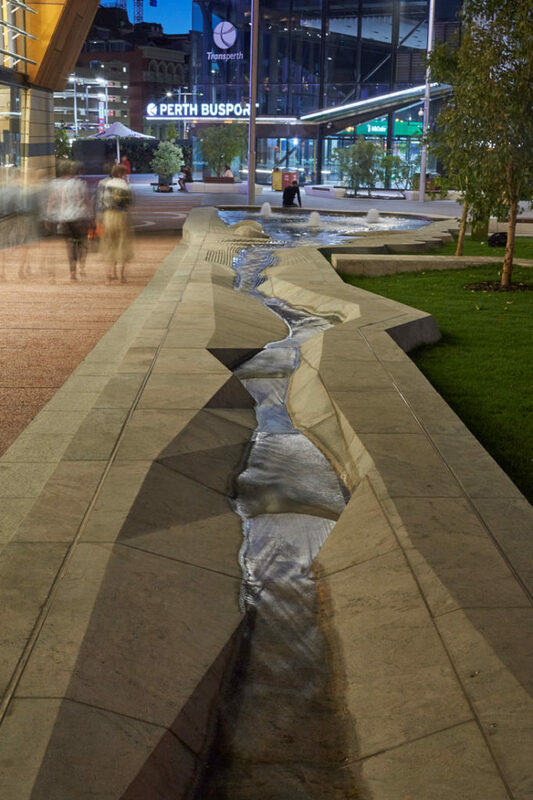 ASPECT Studios worked with a range of artists on the project, including multi-disciplinary artist Jonathan Tarry, whose sculptural water feature, aptly named Waterline, is informed by the Western Australian landscape and water formations and reflect the site’s Traditional Owners. 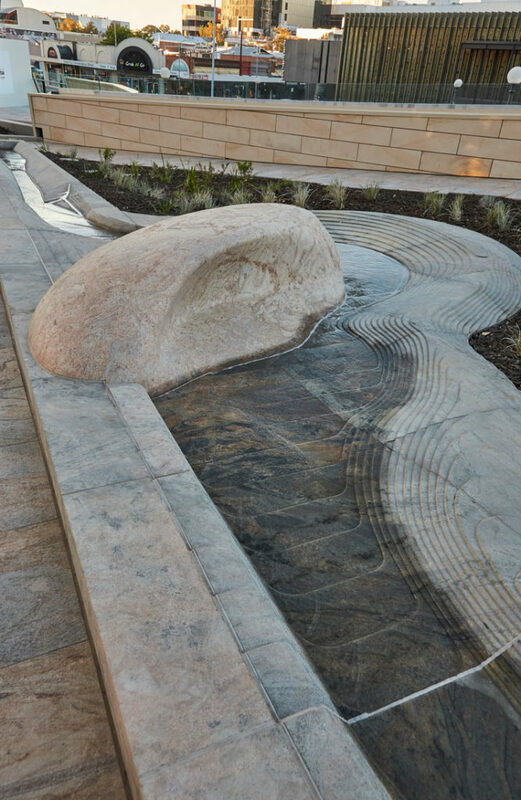 Over 200 metres long, the individually carved Western Australian granite stones transform from regular urban steps and walls found at the top of the site into free-flowing water channels before entering a shallow reflection pool at street level. 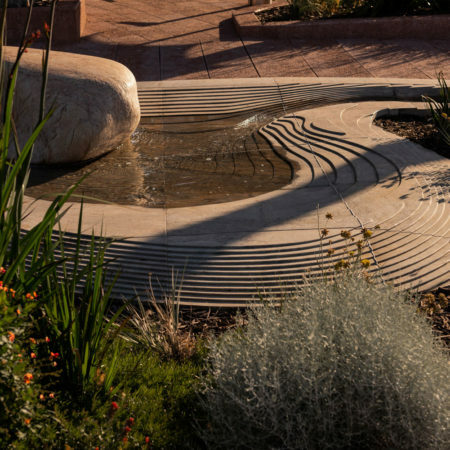 The water feature is deigned to behaviour like water in the Australian dry landscape, ephemeral and drying up to leave water holes and laying bare the rock. 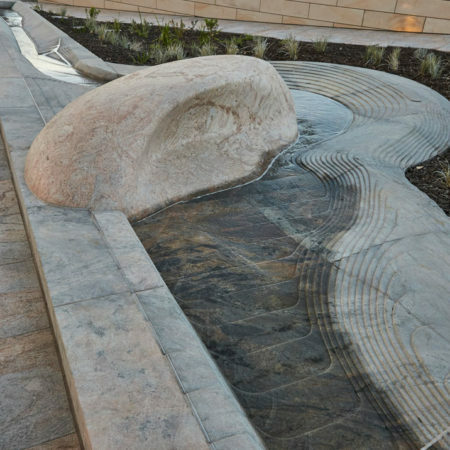 When the water is turned off or down, the stone becomes itself the feature. 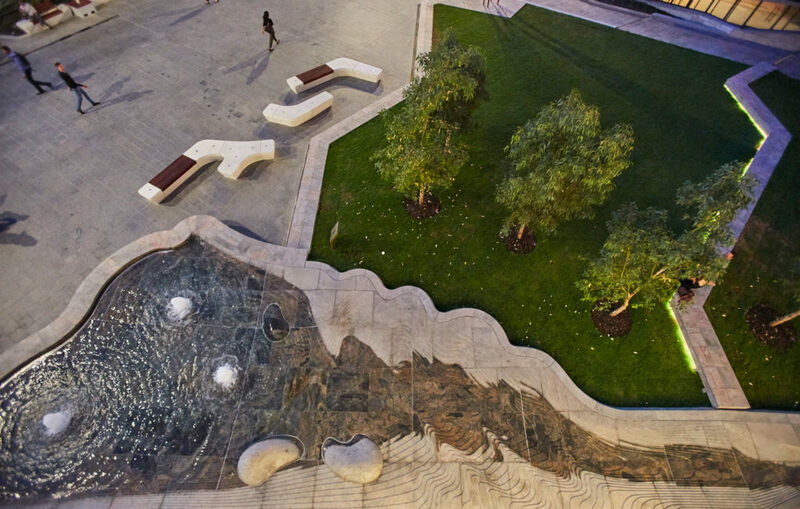 The Waterline encourages visitors to look, touch, feel and enjoy the water and the stone. 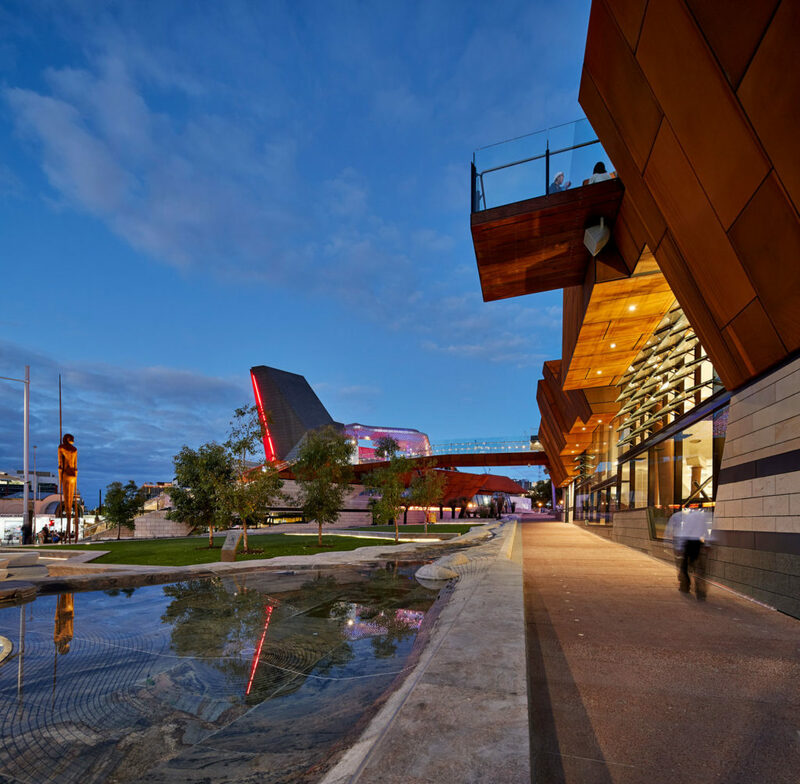 Yagan Square is the outcome of many years of thoughtful collaboration and the technical prowess of the project team. 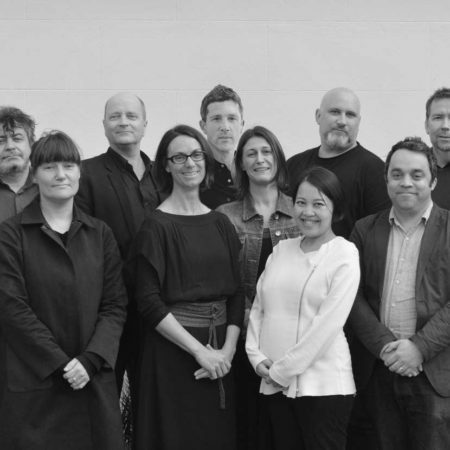 Rewarding collaborations enabled the evolution of thinking through design and delivery. 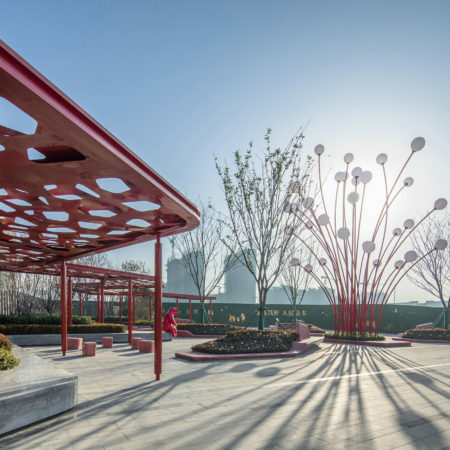 To have the significant level of integration between the architects and landscape architects, collaborating across site elements, the team worked alongside in BIM, conceptually and technically together ‘at the table’. 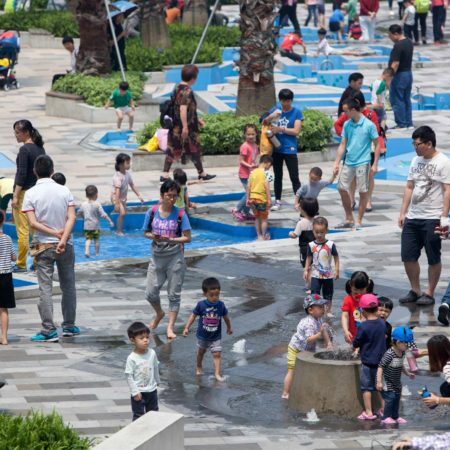 The complexity of urban conditions meant that differences between the architecture and landscape responses were largely dissolved. The commitment to a relationship with Traditional owners through the Whadjuk Working Party brought us all together in a process of creative collaboration, not just consultation. 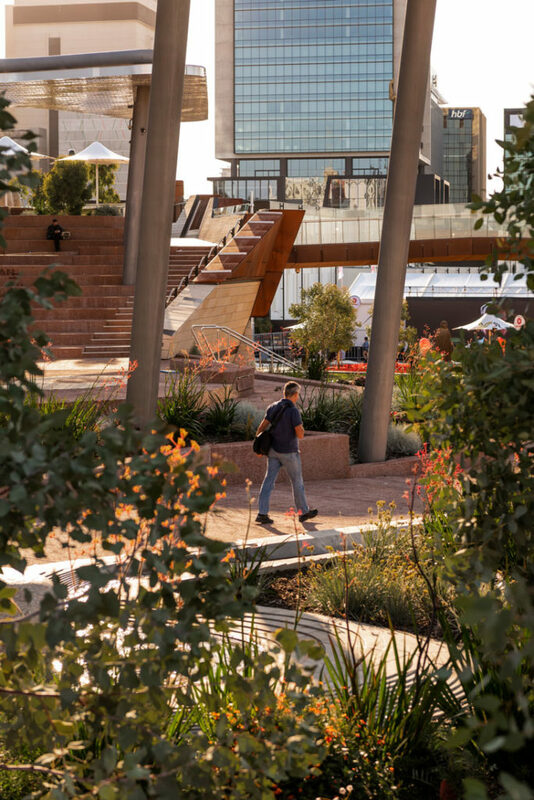 With the majority of the landscaped areas sitting either on top of infrastructure or built form, Yagan Square involved the creation of a highly complex landscape, reliant on intensively integrated design between landscape architects, architects, engineers and arborists. 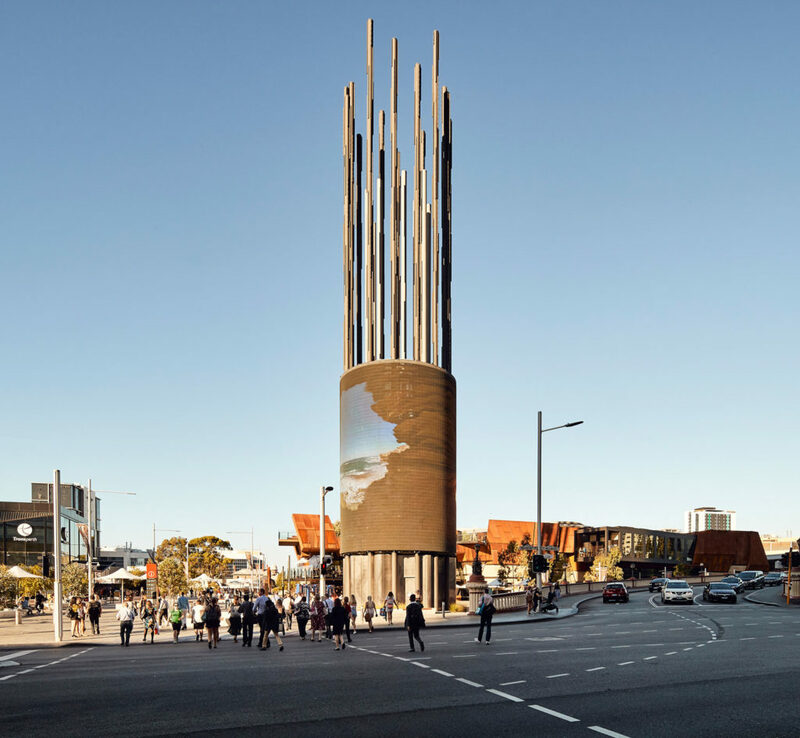 Integrating the sloping tunnel into the design for Yagan Square was an engineering feat. 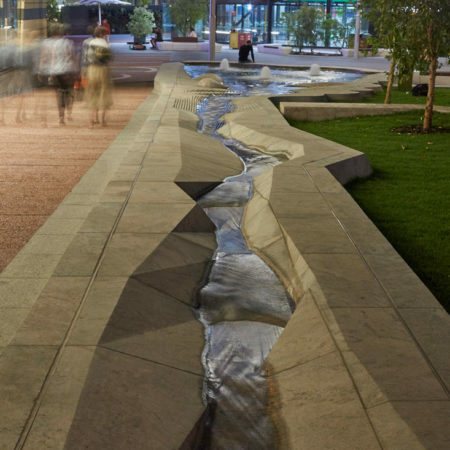 Multiple green infrastructure techniques were required to support this integration, including lightweight soils, void formers, peddle systems for pavement and strata vault systems for trees. 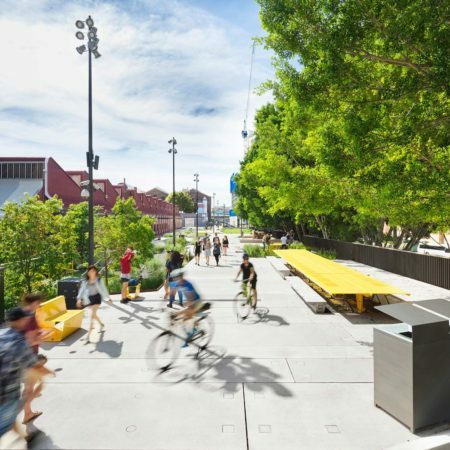 In creating connections to realign the city with its prior landscape, ASPECT Studios sought to include a number of Western Australian tree species unavailable commercially. 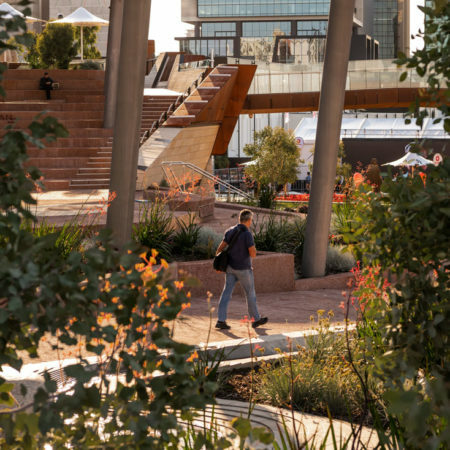 These needed to be grown to a substantial size from local provenance seed off site and then transplanted into challenging urban environments, in high-level podium spaces and atop underground railway lines. 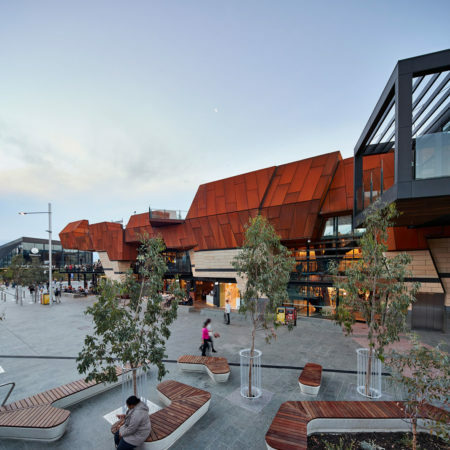 The design process provided ASPECT Studios with an opportunity to test new avenues of collaboration and documentation through BIM and 3D modelling for design, construction and fabrication. 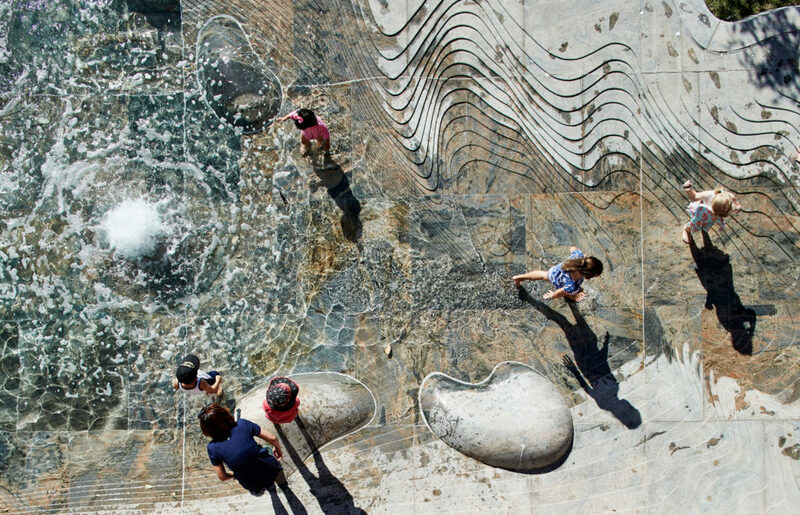 The immersive Waterline artwork includes integrated sculptural art elements set in carved stone paving, modelled using Rhino 3D and documented for construction in Revit. 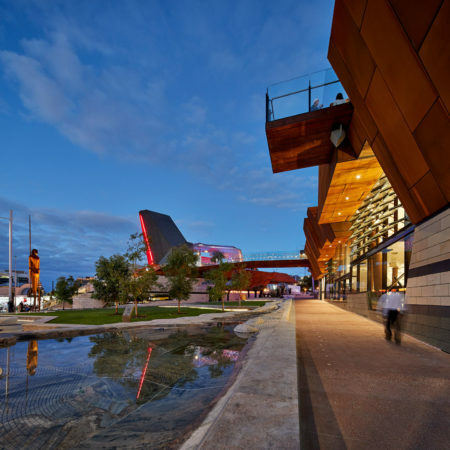 Yagan Square was an ambitious project that needed to address a deeply complex set of urban design issues. 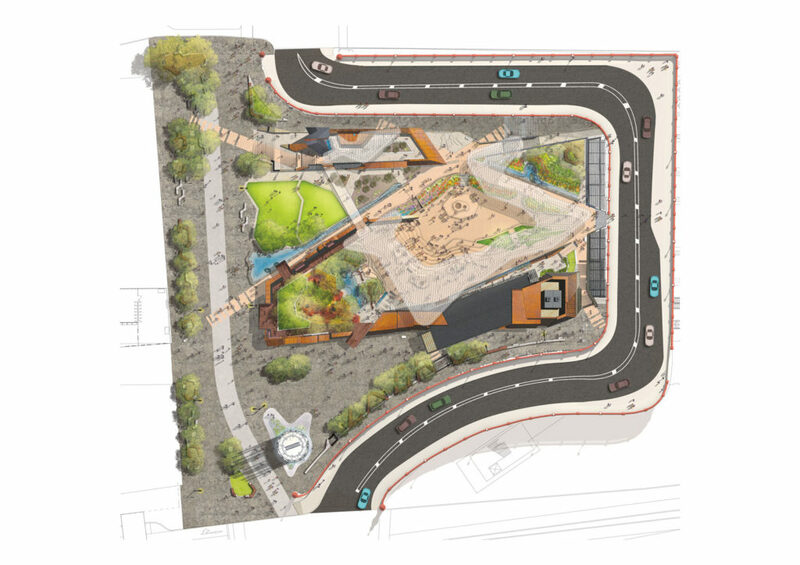 These included pre-existing infrastructure, commercial viability into the future, and opening up new corridors between the city centre and northern precincts. Underlying these issues was the steadfast desire by the client, the MRA, to meaningfully address Aboriginal reconciliation. 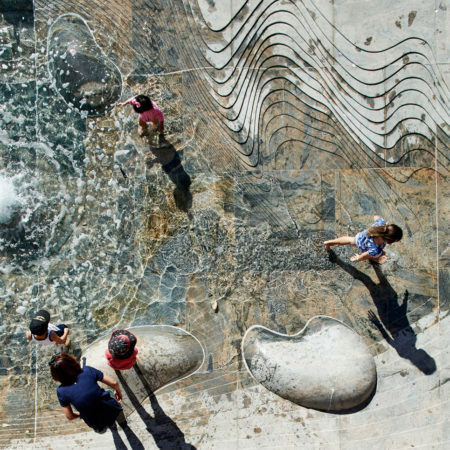 This has shaped the outcome and the heroic spirit of place. 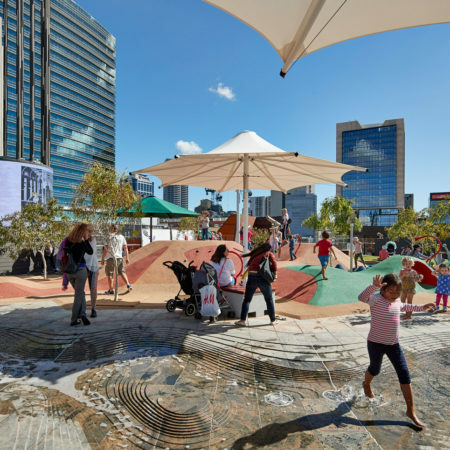 The civic presence of Yagan Square has emerged from the underlying systems of place. 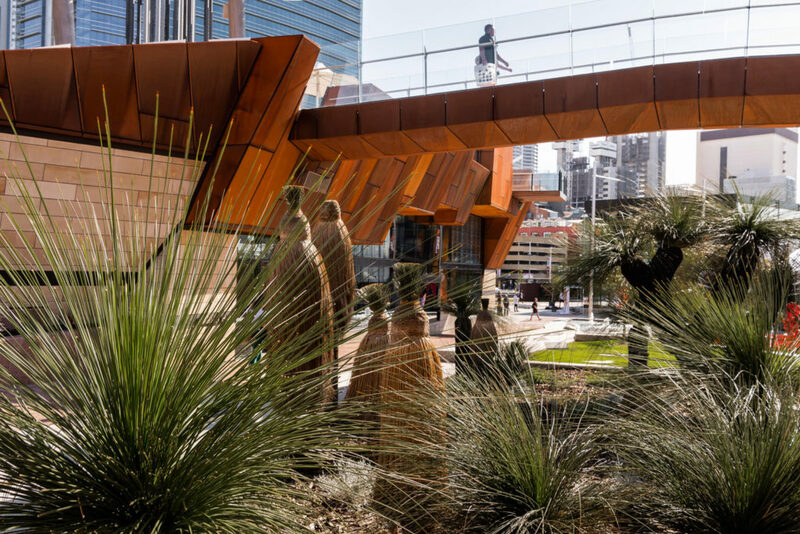 The result is an iconic destination that showcases West Australian heritage, environment, produce and culture, which is embraced by locals and visitors alike. 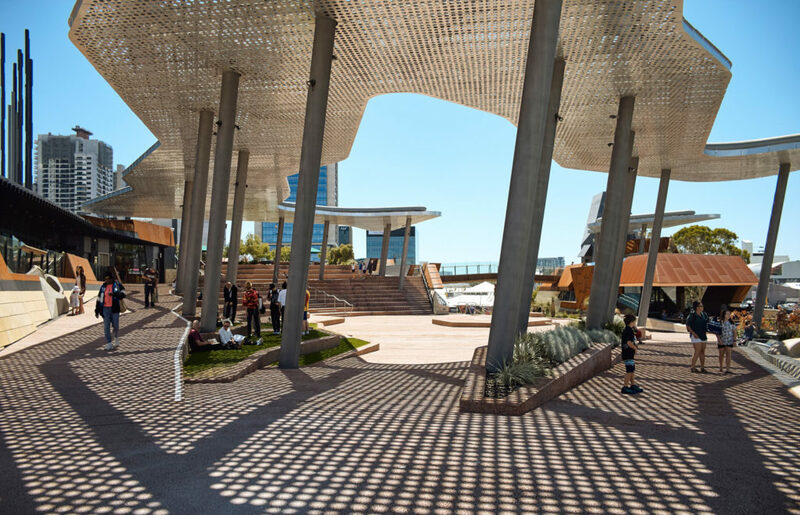 The new heart of Perth, Yagan Square stands as a global blueprint for successful public realm design that is grounded in the authentic expression and understanding of place. 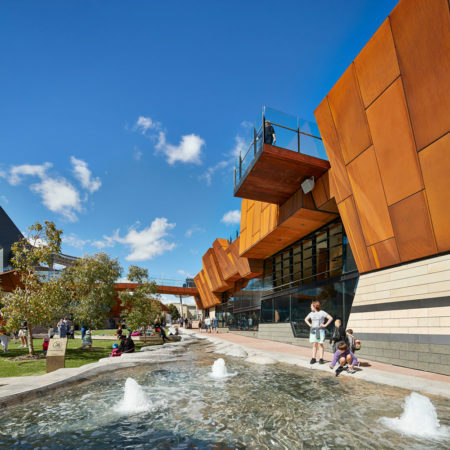 Other designers involved in the design of landscape (if any): Lyons, iredale pedersen hook architects, Jon Tarry, Material Thinking, Whadjuk Working Group, Ramus, Malcolm McGregor, Richard Walley. Project location (For publicly accessible projects please include exact address. For Private gardens place write Country or State): Wellington Street, Perth, Western Australia, Australia.